Any one remeber the great Zoom ice-lolly of the seventies by Lyons Maid? Or how about the Strawberry and Vanilla ice-lolly caled Fab. Remember Jubilee lollies or the Space 1999 ones? If you were a boy and you wanted to be a man, then you would opt for the Cider Quench a real mans ice-lolly, though i suspect zero alchol was involved – a bit like the cans of Panda Shandys. For much of the seventies, Lyons Maid had a long association with Gerry Anderson productions. This led to a promotional deal with TV and cinema adverts featuring characters like Thunderbirds and Joe 90 promoting their lollies. In addition, many of the lollies had collectable cards with character lolly sticks. Kevin Keegan promoted an ice-lolly in the seventies called Goal. Some lollies had face masks such as the Star Wars series, they had masks of Chewbacca, a Storm Trooper and C3P0. 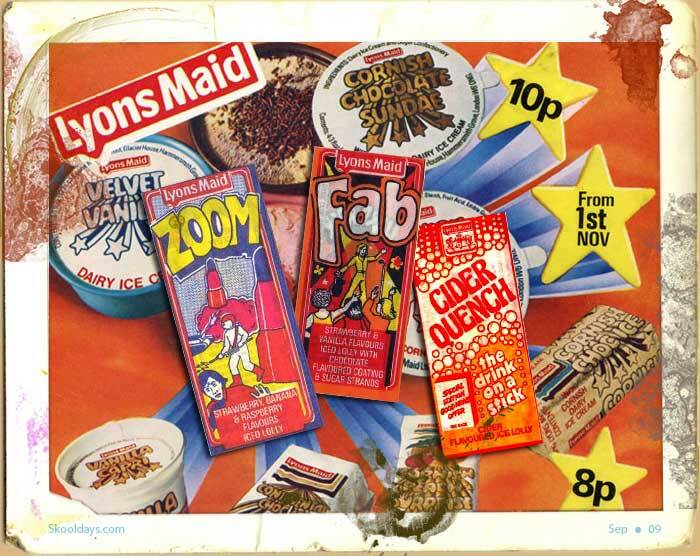 Any one else remember these freesing blasts from the Lyons Maid past? This entry was posted in LunchBox, Pop Culture and tagged 1920, 1930, 1940, 1950, 1960, 1970, 1980 by Skooldays. Bookmark the permalink. any photos of the van? Lyons Maid Luv ice-cream bar – cant say i remember that one – what years were they?